We’ve taken a look at three stains that can induce pure panic when they end up on your carpets! Here’s how to remove them by using Rug Doctor cleaning solutions. We’ve taken a look at three stains that can induce pure panic when they end up on your carpets! Here’s how to remove them by using Rug Doctor cleaning solutions that are available at 3,300 outlets across the UK – most of them are less than a 10 minute drive away – with some superstores being open 24 hours! When using any cleaning solution, it’s important to always test for colourfastness by first trying the product in an inconspicuous area to check if the surface is colour-safe. 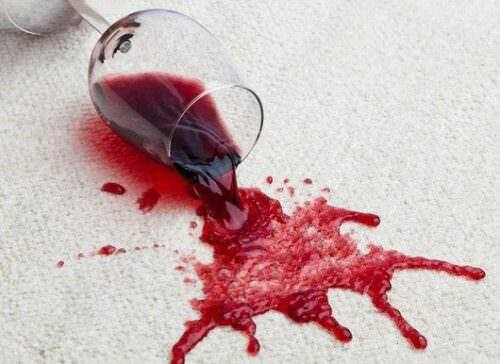 You’re enjoying a glass of red wine when, suddenly, the worst happens and the glass is tipped over and you find your precious carpet with a deep red stain. Don’t panic! Rug Doctor Oxy Power Stain Remover is a Which? Best Buy Carpet Stain Remover and it works by disrupting the chemical bonds of the stain rendering it colourless thanks to its unique oxy cleaning action. This product is safe for use on wool carpets. Not suitable for use on silk, velvet, brocade, vinyl, leather upholstery, oriental rugs or those materials not suitable for wet cleaning. Always check an inconspicuous area for colourfastness. Apply a small amount and wait two minutes then blot away with a paper towel and check for colour transfer. If carpet colour is affected, do not use this product. For best results treat stain immediately. As with any cleaning solution, the use of household rubber gloves is recommended. Do not mix with chlorine based bleaching products. Use only in well ventilated areas. Remove any excess liquid with a clean, absorbent cloth or paper towel. Take bottle and shake well and then turn nozzle to the ON position. Generously spray Oxy Power Stain Remover evenly over the affected area and let stand for 3 to minutes maximum. Do not over wet the area. Lightly agitate the stained area with a clean, damp, colour safe sponge or cloth – working from the edge of the stain towards the centre, pressing deep into the stain. Repeat as necessary. Heavy stains may require more than one application. Allow carpet to dry thoroughly between applications. Wash hands after use. Pet puddles, nappy overflows and incontinency accidents can all happen from time to time and, if not properly treated, hard urine crystals can form in the carpet pile making it difficult to remove both the stain and odour. Don’t panic! Rug Doctor Urine Eliminator uses a special enzymatic technology which overnight destroys urine and other organic stains and odours. It is especially effective on carpets, upholstery mattresses and pet beds. The sources of odour and stains that are deep within the carpet are eliminated for good. Follow these easy steps to remove urine from your carpet. Apply a small amount of Rug Doctor Urine Eliminator to the affected area. After one minute blot using a white, absorbent cloth and check for colour transfer to be sure surface is colour-safe. When possible, act quickly since dried urine can sometimes have a bleaching effect on carpets and fabrics. Remove any solids or excess liquids. Turn nozzle and generously spray area. If using for urine or other penetrating types of stains, be sure to thoroughly wet area allowing product to reach backing and pad. Do not blot or wipe – enzymes need moisture to work. Place a damp colour-safe towel over the treated area and let dry naturally. In most cases it’s best to allow area to remain moist overnight. Highly contaminated areas may require a second application. Once dry, if discolouration remains, simply dampen with water and blot. Apply a small amount in an inconspicuous area. Blot using a white, absorbent cloth after one minute and check for colour transfer to be sure surface is colour-safe. User assumes all risks. Lightly agitate stained area working from edges toward centre. Rinse with water and blot to dry. We have a whole range of cleaning solutions available to treat most household stains; you can even purchase the Rug Doctor cleaning solution you need online at www.rugdoctor.co.uk Don’t delay; bring your carpet back to life with a Rug Doctor cleaning solution today. This entry was posted in Carpet Cleaning Tips, Carpet Cleaning, Stain Remover, Stain Prevention, Hacks. Bookmark the permalink.